I have been asked by a number of local and domestic clients about all the various terms and names used associated with timber roof construction. 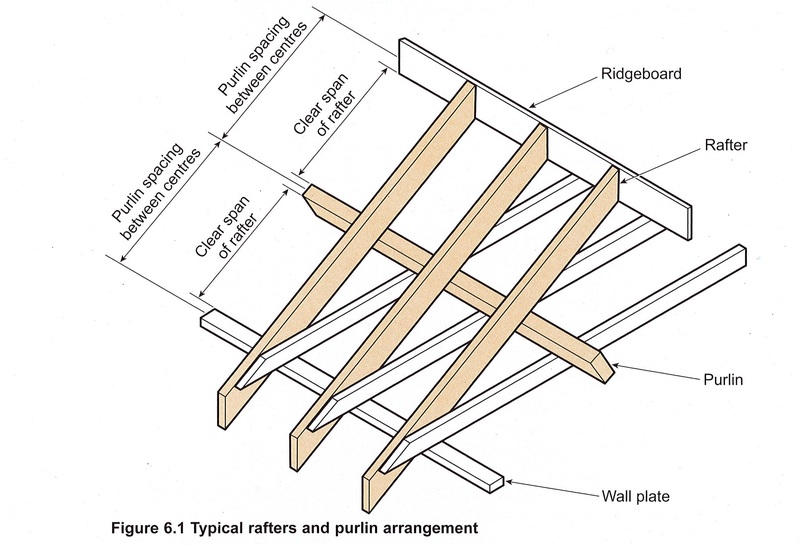 It is especially difficult when joiners are using phrases like purlins, noggins and rafters. I have found a couple of very useful diagrams published by Trada, which is the UK research federation on all things timber. These diagrams are used in Loadspan tables adopted by Engineers to calculate the capacity of sections of timber used in the UK building industry. Please click on the image for a larger version. In the following section, I will attempt to explain what each element does. Floor Joists – As the name suggests, these hold the floor up and are what is used to walk on beneath floor boards. The exact arrangements depend on how these are supported by the structure and they may existing both at ground floor or at first floor level. They are generally at even spacing’s and run perpendicular to traditional floorboards. Ceiling Joists – These are located in the ceiling and are used to suspend the finishes of the ceiling. This may be plasterboard, or in the case of historic structures, laths and plaster. Again they are at even spacing’s and may or may not coincide with the roof structure above. Ceiling Binders – These can be used to restrain and hold the ceiling joists above, especially if the ceiling joists are long. They can be supported either by the structure or built into the fabric of the building. Generally they are located either at 1/3 spans of the ceiling joists or mid span. 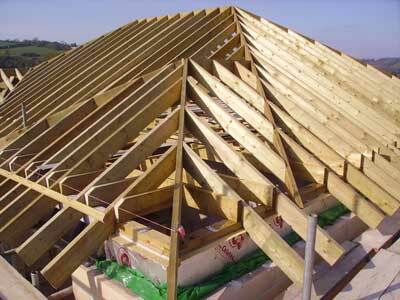 Rafters – These are the main support to the roof finishes and span down the roof line to create an even surface. They are held at the top by the Ridgeboard and at the bottom on the Wall Plate. They can also be supported by Purlins at a point along their length. 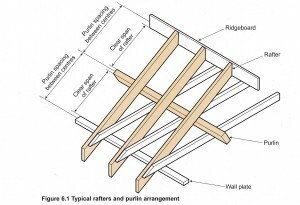 Purlins – These act a bit like Ceiling Binders for Rafters. They provide support to the rafters along its length and push loads back into the structure. This is normally the external fabric of the building or another timber structure. 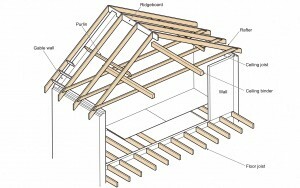 Ridgeboards – These act as the spine along the top of the roof. They allow the rafters to be held along the top and brace each other. The Ridgeboard carries little or no load as rafters normally correspond to each other along the side of the ridgeboard. Wall Plate – This is located along the bottom of the truss along the top of the structure. 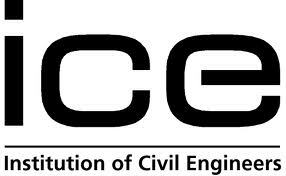 It is normally cement bonded onto the blockwork or masonry wall and is supplied as treated timber, i.e. it has been impregnated with a moisture resisting chemical. 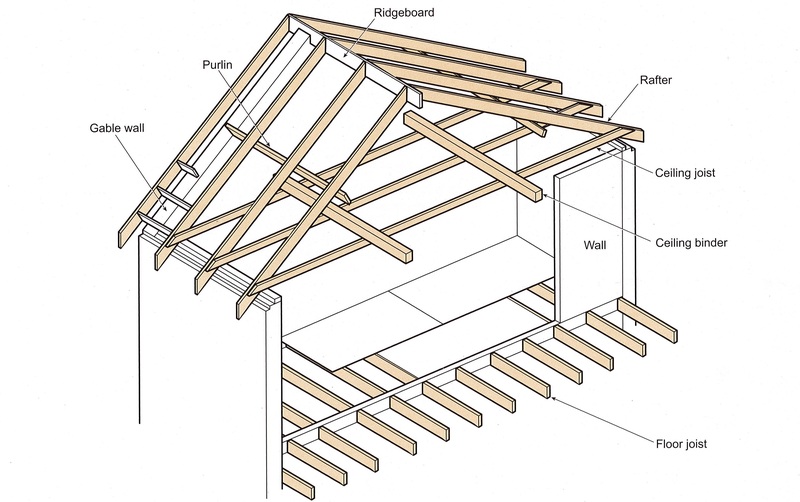 Rafters or the modern trusses are nailed to the wall plate to stop movement and overall it is used to transfer loads from the roof to the structure beneath.